Previously, the Jawa Forty-Two was rendered as cafe racer with a semi-fairing design. 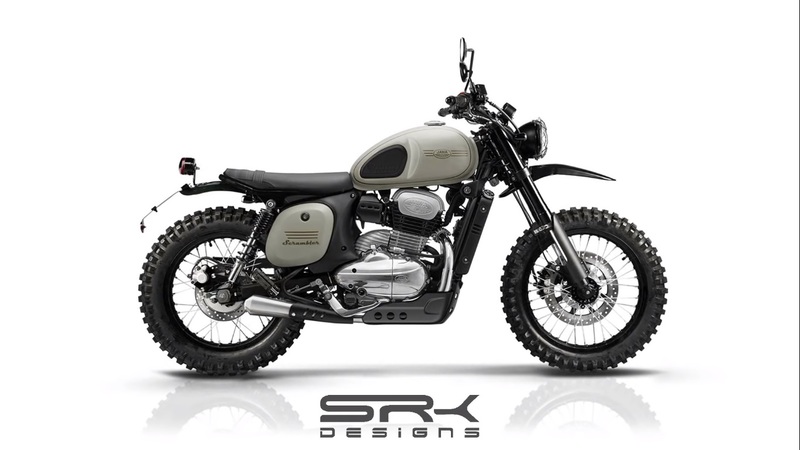 Now, digital artist Shoeb Kalania has imagined it in a rugged avatar as a scrambler and shown the rendering process in a video. The digitally created Scrambler-style motorcycle gets several changes to make it ready for serious off-roading. For starters, the fascia gets a rugged look with the addition of a headlight grille. The headlamp is smaller than the original unit. The front fender has been removed from the usual spot and moved higher, giving the motorcycle a beak-like design. The fuel tank is imagined with rubber pads on the sides for better grip while standing on the footrests. The rear part of the tank gets a leaner design to offer more space to move around while off-roading. The saddle is a shorter unit than on the standard bike. Like the front fender, the rear fender has been imagined in a taller positioned, with the tail lamp on the top of it. A bash plate further enhances the off-road persona of the rendered motorcycle. A pair of dual-purpose tyres with knobby design wrap the wire-spoke wheels for a more rugged look and better traction on the loose and muddy surface. Lastly, the rendered model features a shorter exhaust unit. A darker shade ensures that the motorcycle drops the retro look for a rugged appearance. The revised front suspension setup of the rendered Jawa Forty-Two includes upside-down forks that have fibre protectors. The rear-end has the same twin-sided springs. Braking department includes disc brakes on both ends. Jawa already offers rear disc brake/dual-channel ABS variants of the Classic and Forty-Two. It is a commendable job by Shoeb Kalania and watching the motorcycle take the scrambler form in the video is quite satisfying too. The rendered Jawa Forty-Two Scrambler has several changes, such as knobby tyres, upside-down forks and a bash plate, for being off-road ready. To give you a quick recap about the standard motorcycles, the Jawa Classic and Forty-Two are available in two variants each. The base variants (rear drum brake and single-channel ABS) of the Classic and Forty-Two were launched in India at INR 1,64,000 and INR 1,55,000 respectively. Classic Legends extended the line-up with the addition of rear disc and Dual Channel ABS variants priced at INR 1,72,942 and INR 1,63,942 respectively – all prices are ex-showroom Delhi. Both models share the same engine, and the ARAI certified fuel economy stands at 37.5 km/l.